RaceTek is a premium motorcycle spares and accessories manufacturer. RaceTek is a premium motorcycle spares and accessories manufacturer, used on the current range of Herald Motor Company motorbikes. RaceTek has 30 years of engineering and road safety expertise behind the name.Lightweight, highly engineered and tested on the track by our very own race team, RaceTek parts have been designed to improve bike’s performance and style. Suitable for racing, road and off-road bikes, at a competitive price, to give you the edge! Based in Huntingdon, Cambridgeshire. 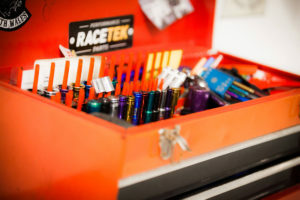 RaceTek has been developed by the team behind the Herald Motor Company. 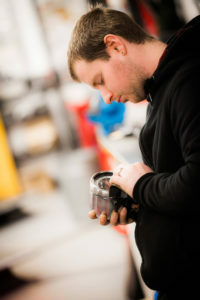 All of the RaceTek parts have been designed, developed and tested in the UK to strict quality criteria. The parts have been put through their paces on the race track too, over the years – in the Thundersport Supertwins 650 class and the Isle of Man TT. We work with True Heroes Racing team, supplying them with our quality parts. This team is made up of injured UK Service personnel, started by a serving Royal Navy sailor after he returned from several tours of duty in Afghanistan. The team’s aim is to use competitive Motorsport as a way to restore a sense of direction and focus, and prove they can compete on a level playing field with their able-bodied counterparts. 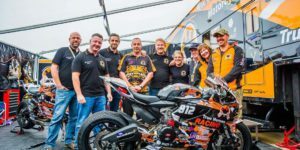 The team, formed in 2012 included LCpl Murray Hambro, who lost both his legs below the knee in an explosion in 2010; he is able to ride a motorcycle using artificial legs. Other team members include Cpl Luke Smith, another injured rider who suffered severe hearing loss in an explosion in Afghanistan in 2011. They have big plans for the 2018 season at the British Superbikes Championships, in the Pirelli National Superstock 1000 Championship and Ducati Tri-Options classes. The 4-rider line up will be the team’s first step on the road towards having the first injured military team racing large capacity machines in the premier British Superbike Class.